Two big concerns of working or simply spending time outdoors in cold weather are frostbite and hypothermia. Both can occur at much higher temperatures than many people realize. For example, exposed skin can start to freeze at just 28 degrees Fahrenheit (-2 degrees Celsius) and deep frostbite can cause blood clots and even gangrene. Hypothermia is a potentially fatal condition caused by loss of body temperature, even in winter conditions people might not consider particularly nasty. Symptoms include fatigue, nausea, confusion, lightheaded feeling and profuse sweating. Without medical treatment the victim can lose consciousness and die. Wear the right gloves for the work you are doing. Gloves should have enough insulation to keep you warm and prevent frostbite, but be thin enough so you can feel what you are doing if you are manipulating controls or tools. Dress in layers of light-weight clothing which keep you warmer than a single layer of heavy clothes. Remove layers as necessary to prevent overheating and perspiring which can lead to chills or hypothermia later. Remember that wet clothing is 20 times less warm than dry clothing. 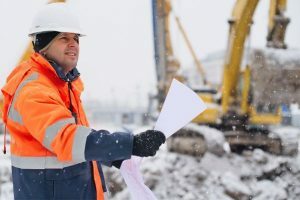 Wear a hat and you’ll stay much warmer when working in cold conditions. As much as half your body heat can go up in steam off the top of a bare head. Check your winter wardrobe for entanglement hazards such as loose sleeves and dangling drawstrings. Look at the soles of your winter footwear. Your shoes or boots should have adequate tread to prevent slips and falls on wet or icy surfaces. Slow down when walking across slippery surfaces and be especially careful on ladders, platforms and stairways. Eat winter-weight meals. This does not mean a high fat diet, but one with enough calories and nutrients to give you the fuel you need. Get plenty of rest. Working in the cold in the winter takes lots of energy. Cold weather can strain your heart, even if you aren’t overexerting yourself.